Far from disappearing from an artist’s regular practice, as many critics have complained, the possibilities for drawing have only expanded in the last century, limited only by the imaginations of their creators. Picasso made drawings with a small electric light in a darkened room. 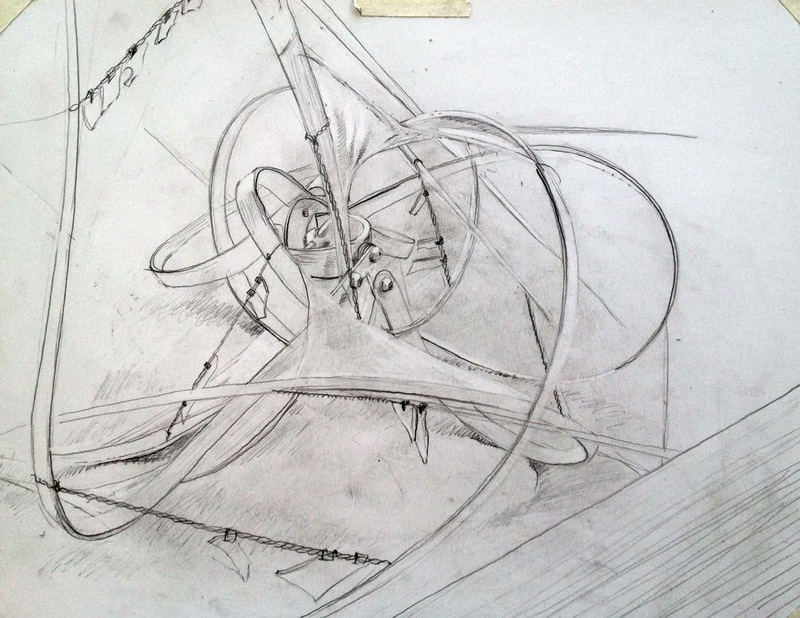 Calder’s Circus can be seen as an assemblage of three-dimensional drawings made with wire. Andy Goldsworthy’s “Rain Shadows,” in which the artist uses his whole body to create an impression on the ground, could qualify as a way of drawing still using that most primitive pigment–wet dirt..
As the survey below reveals, artists still turn to drawing in traditional media—as studies for sculpture or paintings, as a way of unwinding, as plein-air exercises, or just to sharpen one’s skills in seeing. And the medium remains as malleable as ever: Jill Bedgood’s “Rocker and Cradle” series, at the top of this post, are made from sawdust sifted on to wood templates. Are these truly drawings? I don’t see why not. 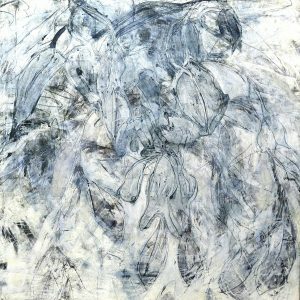 Susan Schwalb: “My primary medium for over 40 years has been the Renaissance technique of silverpoint and metalpoint drawing. 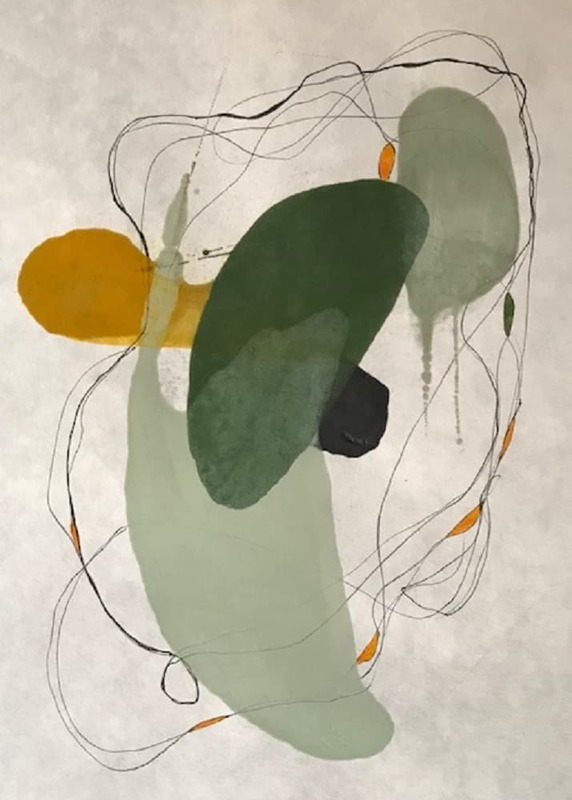 Juxtaposing a wide variety of metals (silver, gold, brass, copper, platinum, pewter, bronze and aluminum), I obtain soft shifts of tone and color. 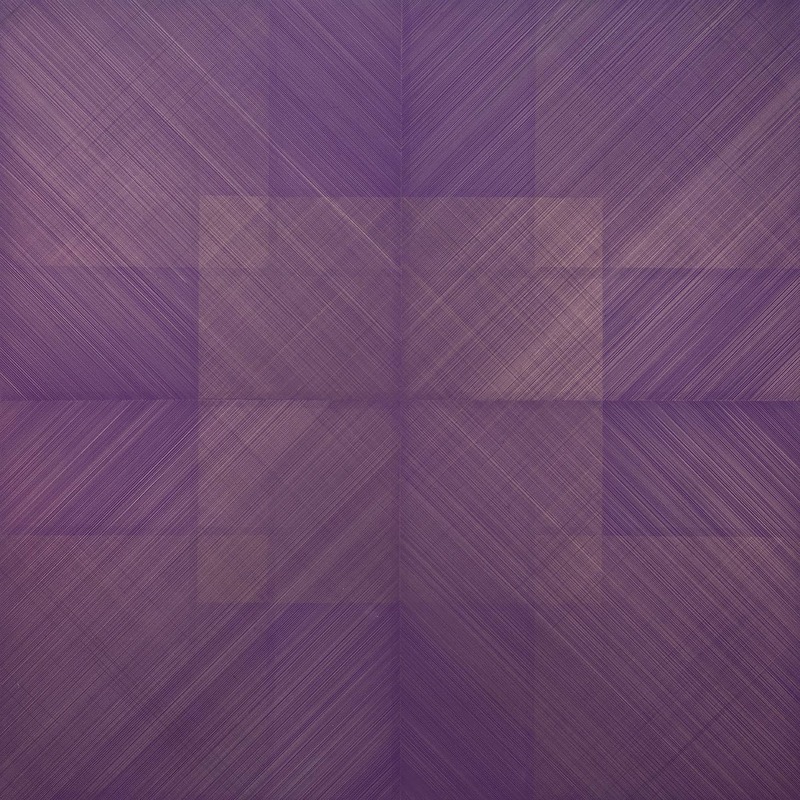 Horizontal lines evoke an atmosphere of serenity, and the shimmer of light on the surface, created by the metals, is quite unlike any of the usual effects. Tracey Adams: “My love of paper began at age three when my father gave me a colorful bundle of origami paper. Sixty years later I’m still in love with Japanese paper, though the processes have evolved from drawing with wax crayons to woodblock printing to different combinations of media, each with its unique qualities. 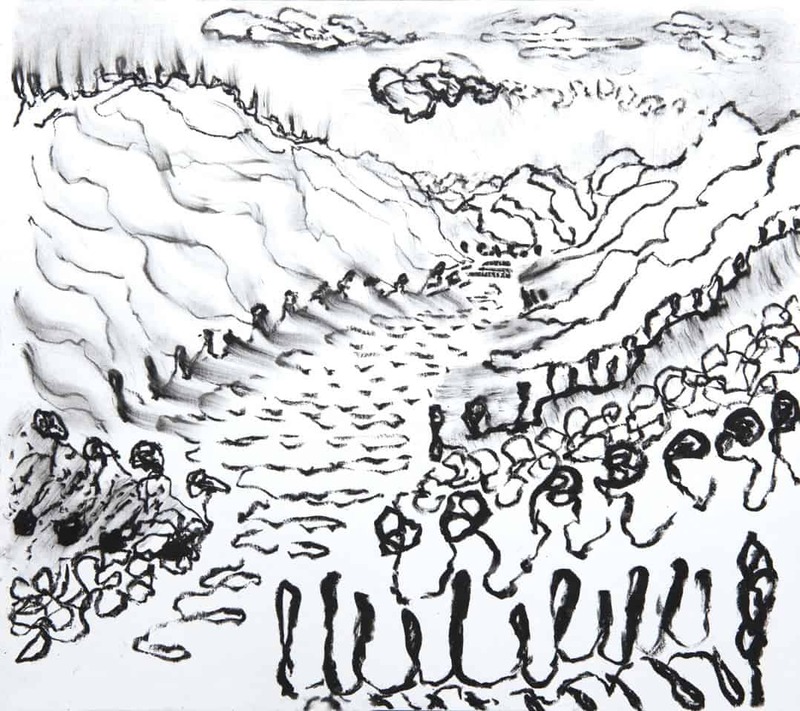 Judy Sigunick: “Drawing helps me to see through a part of my brain which isn’t fully accessed in other ways. 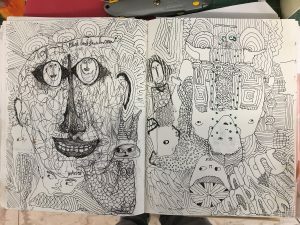 My sketches are oftentimes opening portals for who knows what—without them, I’m jumping into icy water and although an impulsive attack with paint or clay has sometimes produced meaningful and unexpected work, mostly I’d rather not. Debra Claffey: “I do many, many drawings and best enjoy doing trace monotypes, which involves drawing on the reverse of a sheet of paper, picking up the impression from a layer of paint. 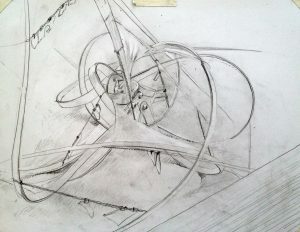 It creates a particular and nuanced quality of line I have found in no other way. I often layer these monotypes on to a panel. The title is from the color. Indigo is a plant-based hue and using it in all its complexity sometimes makes me think of frozen foliage. 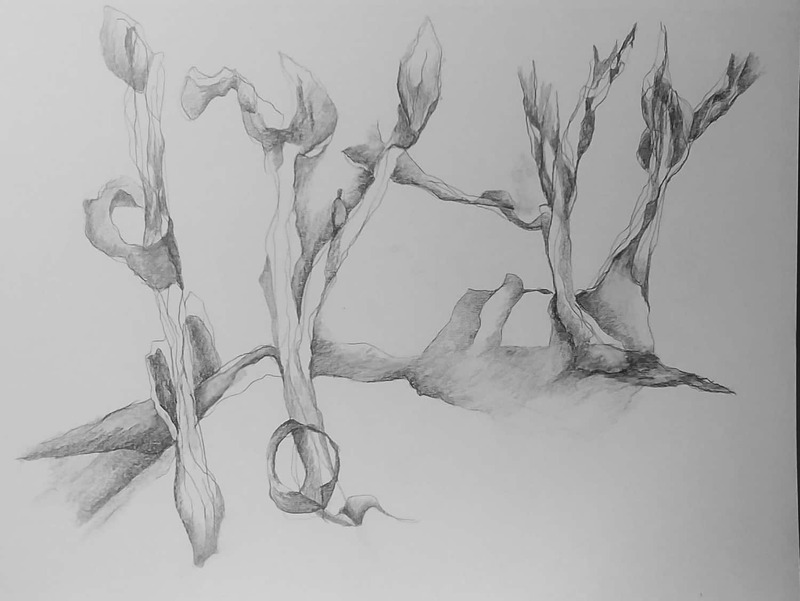 I’m inspired by plants and the forms and contours of foliage. I spend a lot of time as a professional gardener contemplating the intelligence and the adaptability of plants and how little we respect their contribution to our ability to live and breathe on this planet. 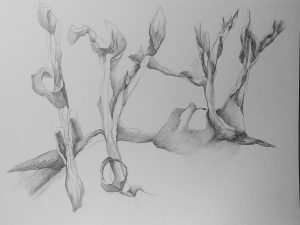 Lily Prince: “My favorite thing to do is plein air drawing, returning repeatedly to a place of particular interest and beauty. 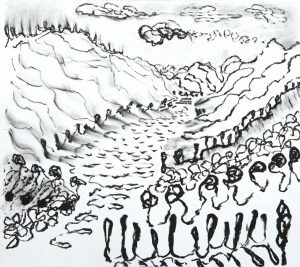 I start by doing a few black and white oil pastel drawings and then move to color. 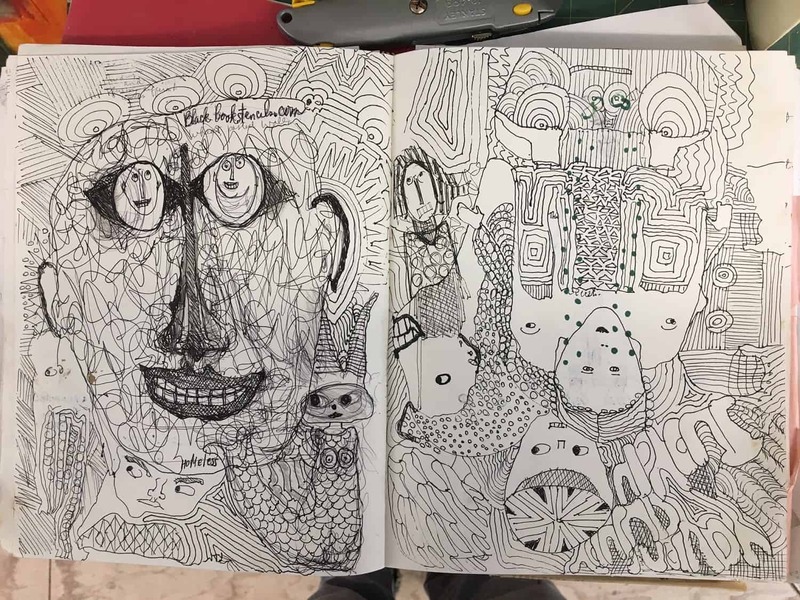 This is from summer 2017, when I was living for the month of August high up above Lake Como, Italy, drawing every day. Jill Bedgood: In 2008, artist and collector Damian Priour sent miniature chairs that he created to 100 colleagues, contained in an eight-inch box. If the artist chose to keep the chair, the artist had to make her own chair, sized to fit the box, and return it for inclusion in the exhibition “The Texas Chair Project” at the Austin Museum of Art. I sent a bag of sawdust with instructions for Eternal Vacation. On the final day of my sister’s treatment for cancer, a friend of hers arrived with two handmade Adirondack chairs. She was thrilled to receive these, and immediately instructed me to place them in the backyard so we could sit together and look at the beautiful mountains and sky of Utah. The following day I had to leave. That was our last time together. When I installed my work at Damian’s home, we talked at length about the experience that initiated Eternal Vacation.Unbeknownst to me, he was also dealing with the same illness. After his passing, Damian’s stone and glass chair became more personally significant. About a year later, it seemed appropriate for me to give the chair to a family member, to pass it on to provide a sense of healing. 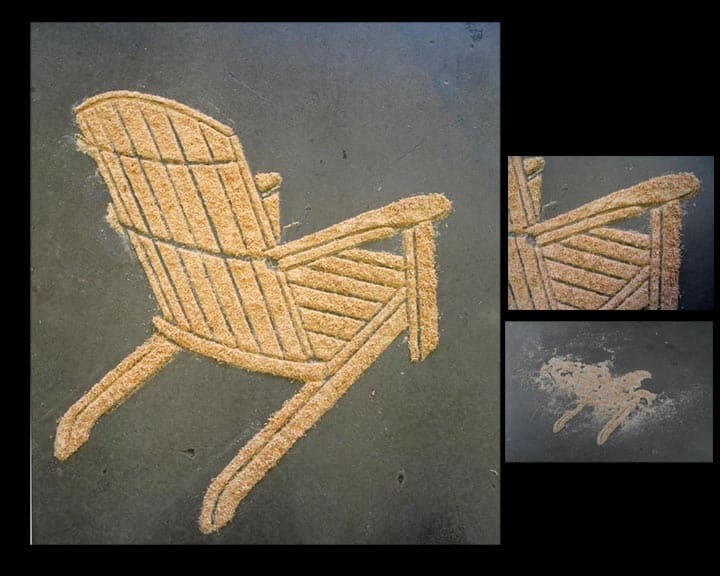 The sawdust chairs are the dimensions of actual chairs. 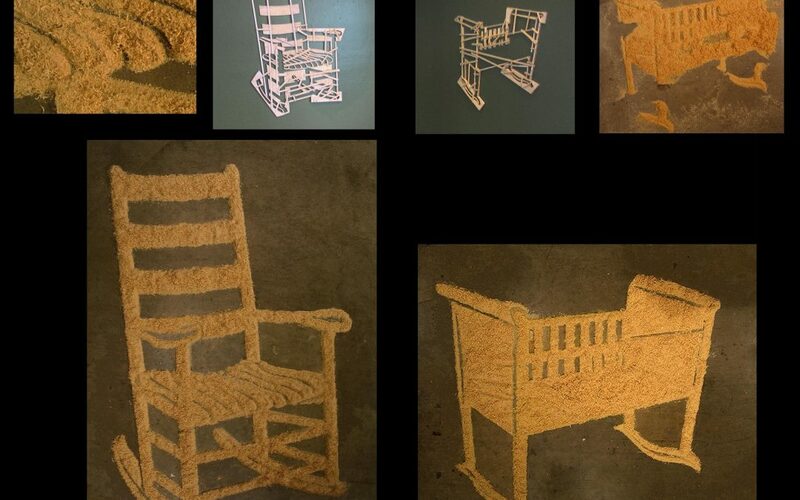 Chairs are drawn on paper; then balsa wood is cut in the shapes of the negative space and pinned together. The wood templates are placed on the floor, sawdust is sifted into the open areas, the template is carefully removed, and the image is tidied. 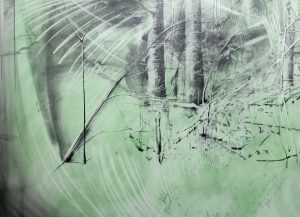 As the viewer walks through the sawdust, it is displaced and distorted, and nature takes its course. The sawdust is swept up and removed at the end of the exhibition, similar to Tibetan Buddhist sand paintings that reference the “transitory nature” of the physical life. 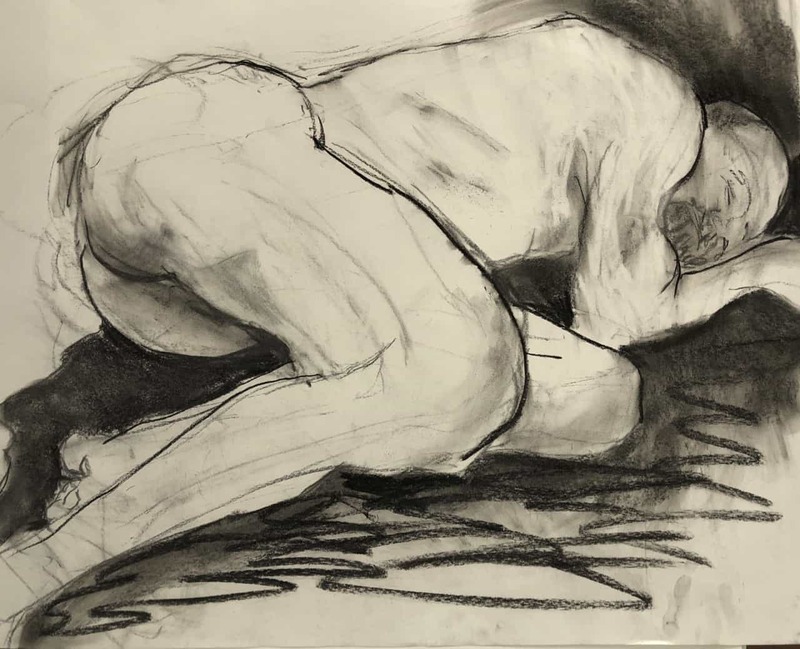 And finally, two who still pursue the time-honored practice of drawing from the model in the sort of life-model classes that have been around since the 16th century. 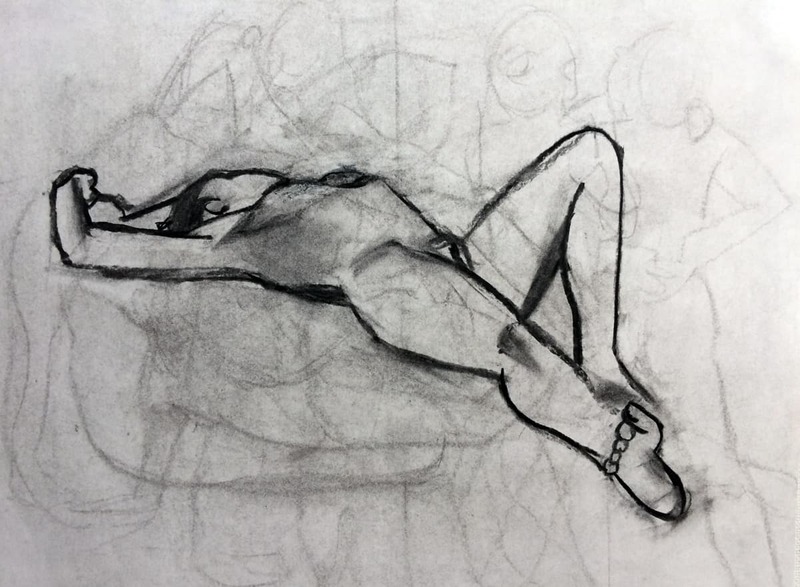 “I use figure drawing to hone my skills in seeing—and I use occasional figures in my paintings—and I love to draw. 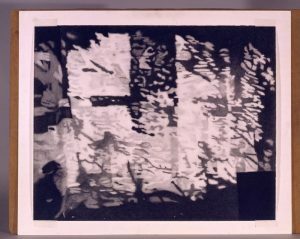 Which is why I was a printmaking major in college,” says Barbara Kemp Cowlin. Wonderful and fascinating compilation. Thank you for including my work!